Alexei Kudrin, head of the Civil Initiatives Committee and former finance minister, said he believes Russia has not yet passed the peak of its economic problems. "Some time ago, many experts, myself included, believed that we had reached the bottom, or, like they say, had passed the peak of the crisis. But today we see some worsening, which November is already demonstrating to us," Kudrin said in an interview with Interfax. He said "this means that the situation is currently unstable." "Plus there is a more serious problem: the sharp decrease in oil prices. If the price stays at this level for another half year or a year, the economic decline will continue," Kudrin said. "Thus, we can't say that the peak of the problems has been passed," he said. "Next year will be a serious challenge. State expenditures will go down, it's inevitable because there will be less revenue. Devaluation has not had its full effect on consumer prices, inflation next year will be some 1.5 percent points higher than the officially projected 6.4 percent," Kudrin said, commenting on the possible negative factors in the economy. He believes "all these things can lead to high loan rates and perpetuation of risks in a whole number of industries, both in production and employment, profits, there is a risk of a new wave of debt non-payment." "The current situation is not very good, but it can now be called stable, except for some banks or specific industries. 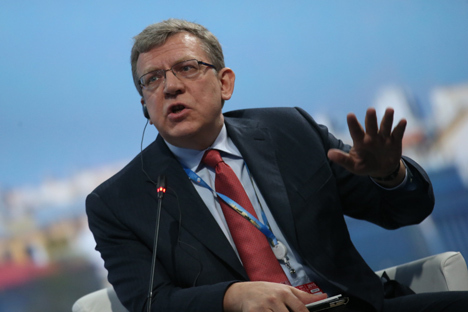 But it may get worse," Kudrin said. "Yes, production is increasing in some enterprises, we see that, too, especially in the export-oriented industries, the situation there is better because devaluation has played its role. Some productions oriented to the domestic market also feel better because devaluation has complicated import and has produced a market niche. Generally, everyone had expected more reaction from industry to the devaluation as some protection from competition and a possibility of expanding production," Kudrin said.